We’re all a bit punch-drunk from a long bus ride, but I thought I should add a brief word. We’ll be traveling tomorrow to Chennai. We’ve spent the last couple of days as true tourists, driving southeast from Delhi to Agra through an early and unexpected rain to visit the Taj Mahal, the marble mausoleum of Shah Jehan. After a few more visits – the Agra Fort, Fatepuhr Sikri, marvelous testaments to Moghul India – we drove back to Delhi today. And so we’ve traversed two points of the golden triangle of the northwest (Delhi – Agra – Jaipur) the most visited cities of India. Take a look at the map and you’ll see we’ve barely scratched the surface. (Indeed, India is some 2000 miles north to south and 1800 miles east to west). We spent a long time on the bus in the last two days. 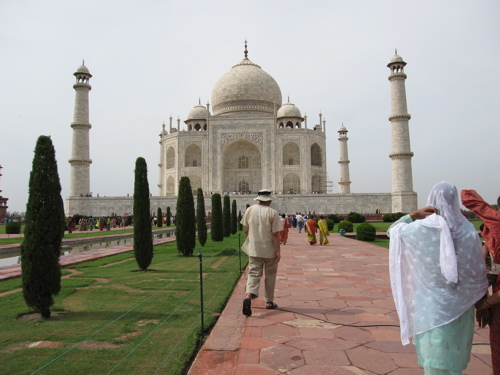 With traffic and detours it took us eight hours to make our way back from Agra today. 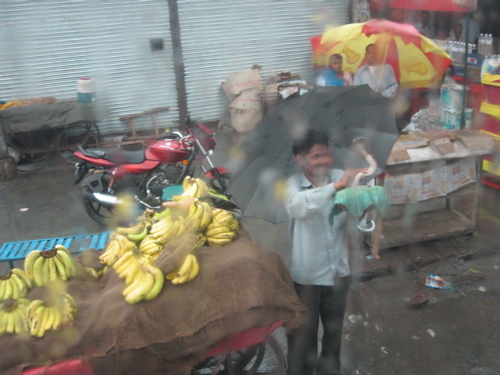 Along the way, we watched a small strip of India through the window. Green and yellow auto-rickshaws humming along on the shoulder of the road. The (mostly) orange heavy trucks painted in beautiful and intricate designs. The constant bleating of the horns. Peddlars standing by at intersections. Stray dogs. Herds of goats. And cows, often wandering in groups of two or three. Brick factories among the fields, their chimneys marking the landscape like exclamation points. On the outskirts of Delhi, sparkling shopping malls three or four stories tall. And as we came close to the city, dense commercial centers of shops and markets, a thick smog hanging low. In the midst of such stimuli I set to wondering about the talks I’ve heard and the reading I’ve been doing. Consciousness abhors a vacuum. A full accounting would take hours and pages. I’ll just note a few of the lines that rang in my head. On the very idea of India. A geographical expression, if you want to get etymological. But what more? Another of our interlocutors, Sangeeta DasGupta (? ): “1947 was the creation of India, but the creation of Indians remained.” What holds India together? It is still an open question. On the struggles of development in “the era of globalization.” Economic growth since the early nineties has been remarkable (GDP growth of 7-8-9 per cent a year, about twice Europe and the US). What has been the effect of this growth on the poor of India? We’ve heard different accounts, but the most compelling (and authoritative?) comes down to something like this, from Aditya Mukherjee: India’s growth has improved the standard of living of the poorest Indians, but not so much as it has improved the lives of the middle class and the wealthy. In other words, the standard of living is improving, but inequality is growing. Yes, we are only scratching the surface here, but it is food for thought.